This trail is on the privately operated Camp Tamarancho. Riders 14 and older must poses a day or annual Tamarancho Friends Pass to ride here. To learn more, click here. This trail is part of the Camp Tamarancho trail system, which contains some of the best mountain bike trails in the Bay Area. If you're riding Tamarancho clockwise, trail starts at B-17 Trail and ends at Goldman Trail. 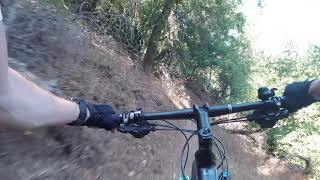 It's not very technical, but it starts off with a fun fast descent through the trees. There are a few mildly technical spots to keep things interesting, but it rolls well for most ability levels. After the initial descent, the trail climbs consistently, but not particularly intensely up to its end at Goldman Trail. Playing in Tamarancho, Marin County. 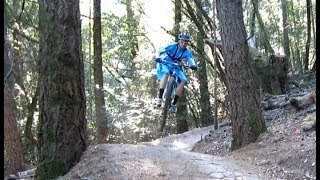 Great riding on berms and doubles!